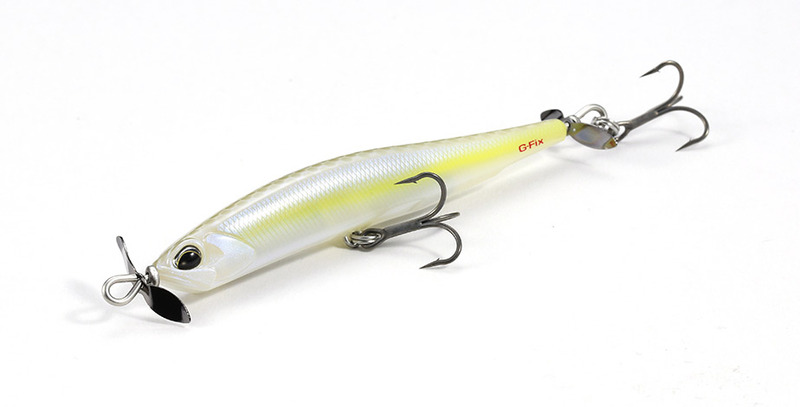 G-Fix`s increased performance and unique signatured action is able to meet windy tournament conditions head on. With the same ultra finesse profile, the spybait is able to effectively trace contours others can’t. Many professional bass anglers are well aware that the Spinbait80 simply outcasted every spybait to hit the US shores and the same is true in Japan. What many didn’t realize was that the new Spinbait80 G-Fix have even a great trajectory. How far? While most popular spybaits hit the averaged casting distance between 80 to 95 feet in a single cast. The Spinbait 80 G-Fix averaged 130 ft. or (39 meters) ! In some cases the Spinbait G-Fix casted over 40 feet more that several spybaits! Realis Spinbait 80 G-Fix is absolutely the best spybait to reach deeper bass or further targets and the only spybait to stay in deep zones longer and more accurately. With the additional weight produced even greater distance, it stays the only spybait designed for professional angling.